Finally made it up to do something constructive and so picked over the raspberries again, and some currants. Not doing much this year really, I seem to be getting sidetracked in evenings with making icing roses for some reason. Probably why not much is growing. Hampton Court Palace Flower Show. Weather getting somewhat worse, with forecast for gales. Nevertheless, got our sandwiches and got on a tube at the earliest time to go to London. Met Michelle in Harrow and off we went to Waterloo. Not a bad journey to Hampton Court, with us arriving about 11.30am. Decided to get water taxi for fun, and then had to wait ages. Daft mistake as it turned out, as we didn't have much time at the show before they took the decision to close it down and promptly turfed everyone out at 3pm. Boo. But at least we got some neat little garden candle lamps and I got a sign reading ‘I'm down the allotment' which I can at last boobytrap the kitchen with, so P know where I've vanished to! Weather really atrocious when we left, driving rain and wind. Pottered about in allotment again, this time doing a bit of maintenance and mostly picking berries. Getting heaps of them now. Redcurrants in plot 2 are looking like little red bells in a cathedral of green, if you stick your head inside the bush! Several hours in the allotment weeding at last. The hoeing I did the other day seems to have worked, and so I could devote my time to getting the larger things out. 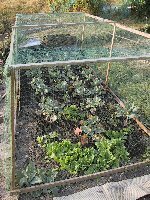 Tidied most of the carrot bed, the courgette bed (still small plants but getting there gradually) and watered everything well. Have not been watering much this year, though they will probably have decent root systems for it! Picked over raspberries again: nearly coming to end now, which is as well! Autumn ones flowering now… and there looks like there will be loads there too. Blackberries starting to ripen - uh oh. I still have loads from last year… Dug a load of little spuds too. They aren't very large but I don't eat that many and they taste fantastic! Mad jam making day. Evicted all of the blackberries and redcurrants from the freezer, as well as this year's raspberry ‘seconds'. Now have 6½ lb of varying flavour jellies (and a lot of sugar awaiting the onslaught of this year's brambles. I'd forgotten what a pig bramble jelly is to get to set. Despite this, 3lb of fruit made 3½lb of jelly, with the half being added to the half of redcurrant I had, so there's a mixed jar :) Raspberry did 1 full jar and half a small one. Recipes here. Nearly eaten the second freezer down now. Two months later than perhaps I should have! Walked up to lottie with a bottle of wine on a lovely evening. Watered the plot and then sat down with Maggie and Jim and watched dusk fall and foxes come out. Agreed it was a funny old season, hardly anything doing well without a lot of irrigation. Up to lottie again, more watering. Had another good watering session to try and stave off the drought, doing my best to drown everything in sight, filling up all the troughs and butts (after moving the large black one to the side of the shed). 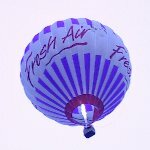 Lugged up another bottle of wine but nobody was around so it went back with me, though did have a bit of fun as a balloon passed right over my plot, and quite low too! Picked a load of blackberries as it went dark, then ate them for tea with some of last year's frozen apples. Very hot day. Decided to make the best of it and do mostly allotment today. I've neglected it far too much this season what with all the other things going off, so it was weeding for me. Prepared properly (factor 30, sunhat) and hoofed it up with the tools. Decided the bindweed in the orchard was way too much of a pain and so started there. It took some hours (interspersed with phonecalls to the chief bridesmaid who is trying to organise my Hen party!) 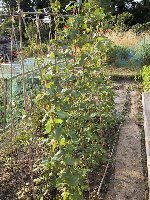 but I now don't have bindweed choking the autumn raspberries, which are starting to fruit. I'm sure it will grow again but at least for now it's not above the surface. Cleaned out a couple of the blackcurrants too, then worked over the patch round the Bramley too. Looks heaps better, though there are still some patches I can't get to easily. Then moved on to the cabbage patch. This is driving me nuts, as I had expected to have cabbages by now! 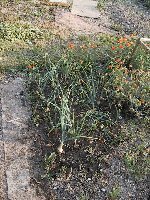 Weeded it pretty thoroughly (by pulling rather than hoeing) and then watered it too. Constructed a bit of raised edge from some of Lee's wood (well he did say I should help myself!) and so that should help the water to stay in the bed rather than run off onto the path. So the rogues' gallery shows what is and what isn't growing. 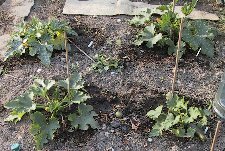 The courgettes are still tiny, though now starting to get some more mature leaves and so I hope that they'll take off sometime in the next 2 weeks now the weather is so warm at night. The cabbages - well I shall just hope. They are, after all, capable of surviving to spring so they should get a fair growing season still. I hope. Onions are tiny, despite getting the sets in on time. Runners are doing very nicely. Compared with last year's Enorma, the Painted Lady plants are producing lots of beans but not very long: 5-6". But they taste very nice as I found out when I got home and ate some with a courgette I'd been donated! 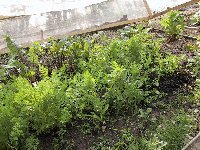 Carrots are looking very nice. Pity I didn't put as much effort into everything else as I did the carrot bed, but at least I'll have one of my bête-noir plants figured out! Beetroot also doing nicely, the original sowing now giving me nice roots and the second set after the foxes got in now starting to fatten up. 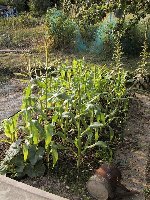 Sweetcorn is stubby compared with last year but the Ovations aren't very tall anyway and I don't really care as long as each produces a cob. Haven't eaten all last year's frozen cobs yet anyway!